The Caesar haircut tends to be outgoing and tough as well among men today. It emanates a strong presence in the room without actually overdoing it too much. 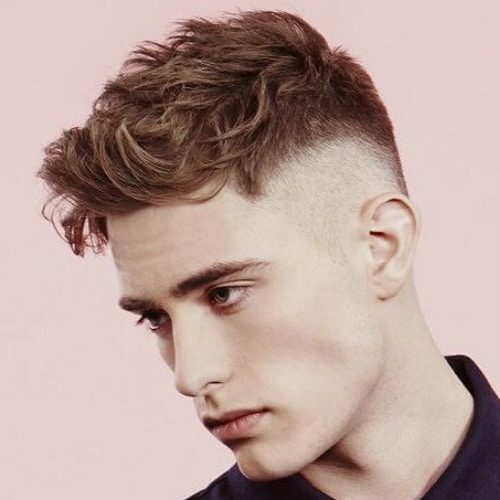 Men who get this haircut are, mostly, quite bold personalities in their outlook towards individual situations and life, not to mention that the Caesar haircut is suitable for young, old, sporty, muscular and brilliant men. If you have really thick hair then it becomes essential to find a haircut that complements it. 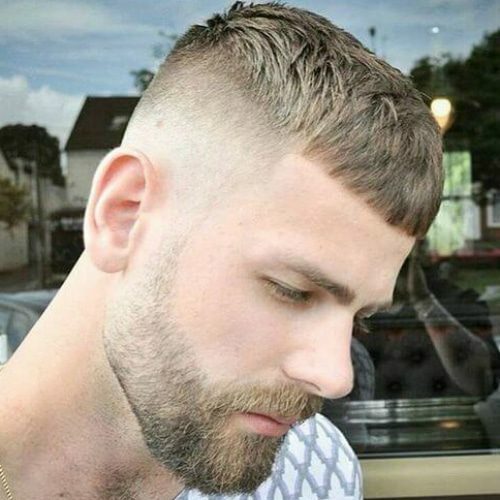 This high fade Caesar haircut is right for you, because it has got all the elements required to fit your needs. 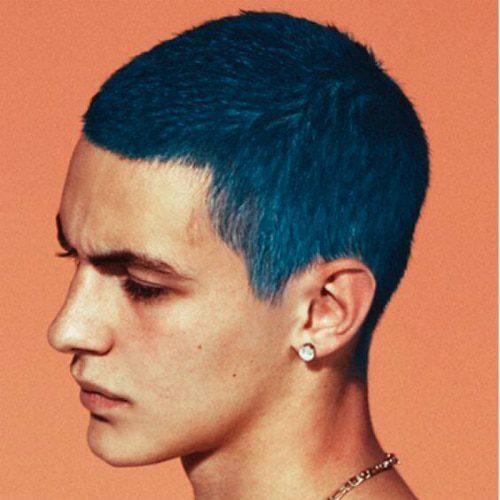 If you have the courage to try this haircut, make sure you make it outstanding by adding designs to it and also your favorite color. It goes well with vintage clothes and a pair of sunglasses. This is one specific example of a classic Caesar haircut. The actual haircut is very traditional, with a cropped fringe and short sides. 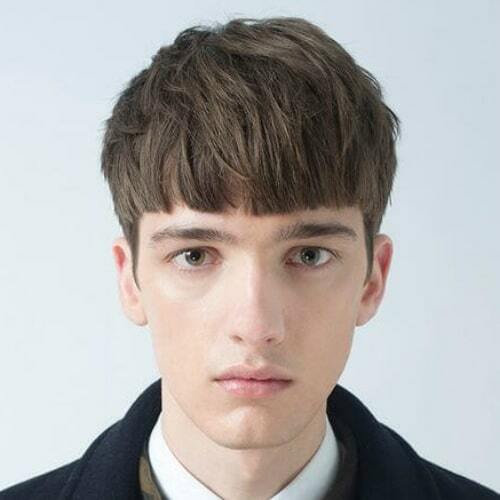 The clean lines combined with the perfect angles and the neat texture make altogether an accurate haircut. Match making for all of you men out there who prefer a little more edge to your hair, this Caesar haircut is funky and flattering. 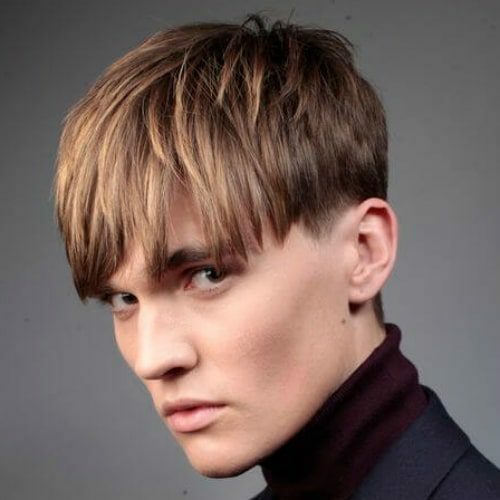 The top section is heavily textured, followed by the rest of the cut that is neat and sleek with very short, faded sides. 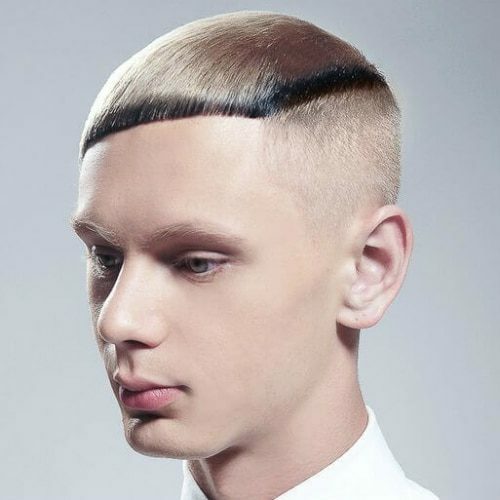 When you combine two different haircuts into one style, the result is what you see below. Here, you have a Caesar and a buzz cut that easily blend. 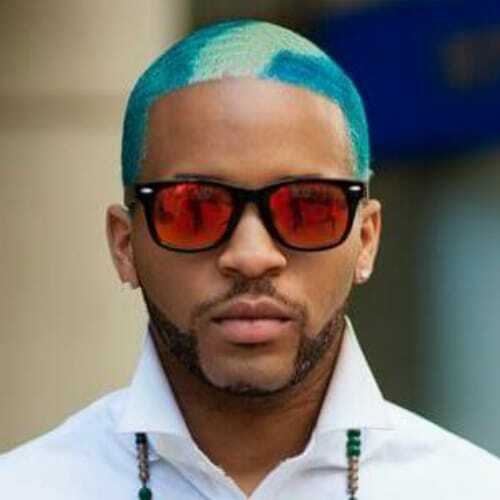 Use two contrast colors to give the haircut precision and a touch of madness. 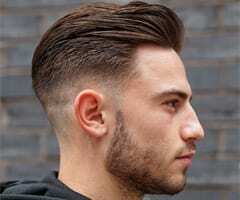 Suitable for men with sharp features, this particular haircut will bring out the best you have got. To make it look natural, heat a bit of hair wax in your hands and apply it on the top by moving your fingers towards the font. Leave the top of your Caesar cut long to add a touch of a personal note to your hair. 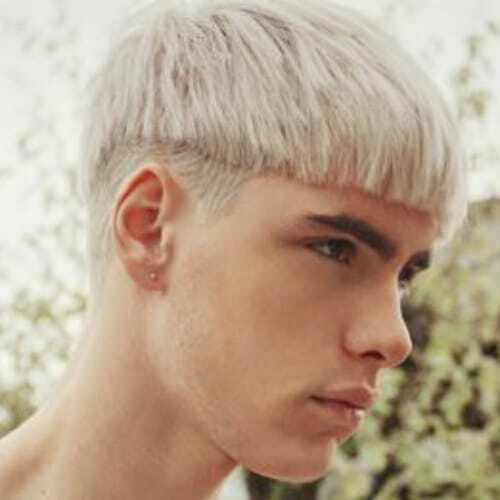 This one features the long top section that is styled almost chaotic, giving the illusion of a bowl cut. 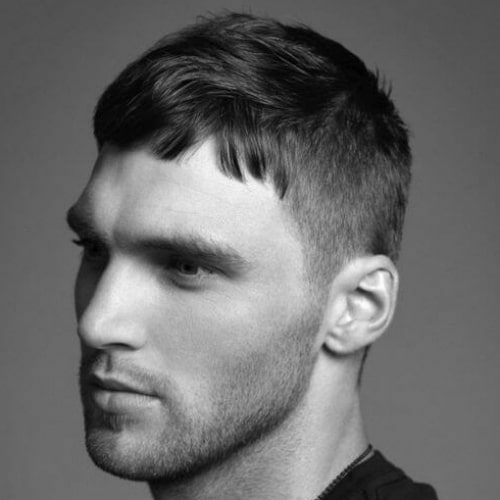 The main attraction of this classic Caesar haircut is the line of the point-cut fringe that continues into the line of fade. Keep the top textured and style it with hair wax in a messy way to give it movement and a touch of volume. 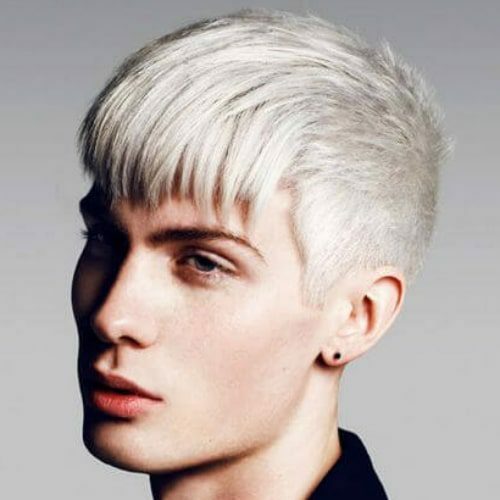 It has been said that blonde hair is unforgiving when it comes to a precise haircut because you can see every detail. 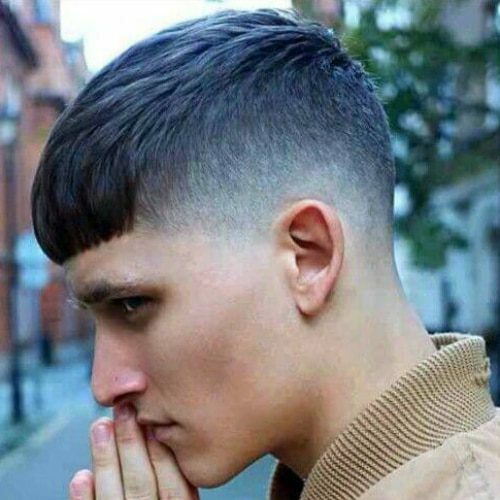 One thing is certain, you can never be wrong with the Caesar haircut. 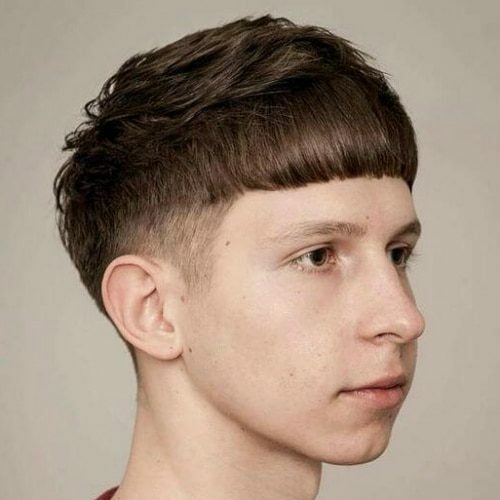 Being visibly long on the top, the Caesar haircut below features the plain, extra short sides and textured top, finger combed towards the forehead. 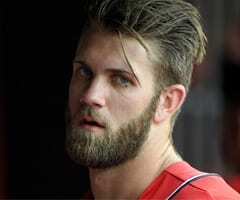 Use the right hair products, and this is the look you’ll be getting. In this picture below, you can notice two different combinations of styling on the top. The first layer is for support and continuity with the back, while the second is meant to give volume and shape. 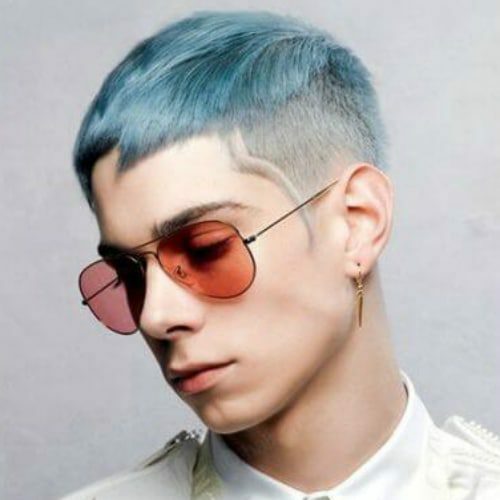 Although this type of haircut that can only be seen in fashion magazines, it most definitely won’t stop an outgoing personality from trying it. 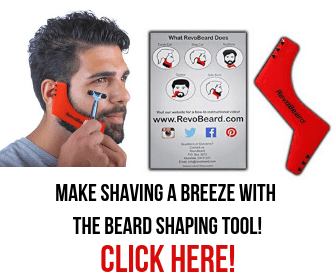 Summer is always the season for change, so this can actually be a great change for you. The texture will always make a huge difference for your hair, and this picture shows it clearly. 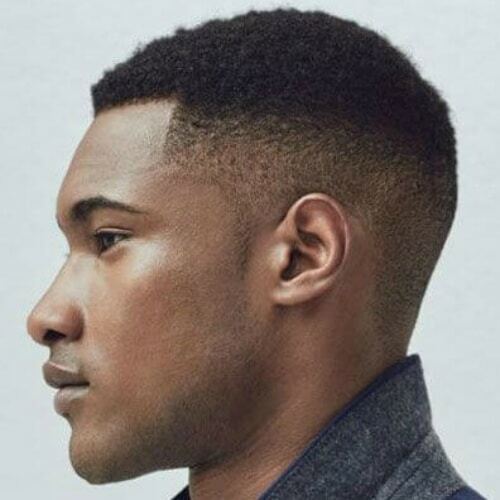 The gradual low skin fade on the sides also adds some beauty to the haircut. 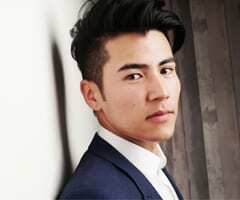 This spiky faux-hawk Caesar wisely mixes different cutting techniques – blunt cut fringe and razor top with messy styling above the forehead and fading on the sides and down the back. 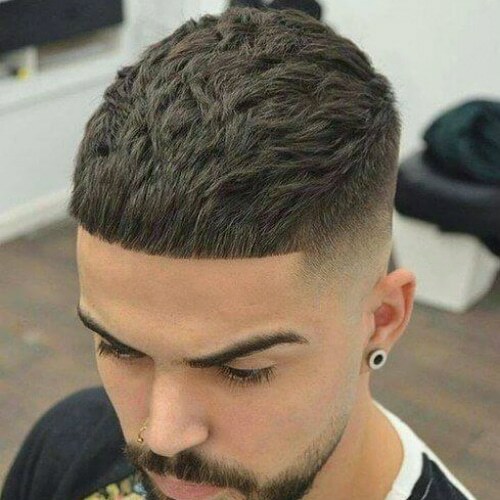 This high fade Caesar will fit in perfectly with your personality if you have a wavy hair. To obtain this look, you need to keep a longer top section while making sure that it is brought to the front by simply using your fingers. Choosing to cut your hair with a razor instead of clippers offers many benefits, one of which is immaculate precision. This razor cut Caesar is executed so perfectly that it most definitely catch your attention. 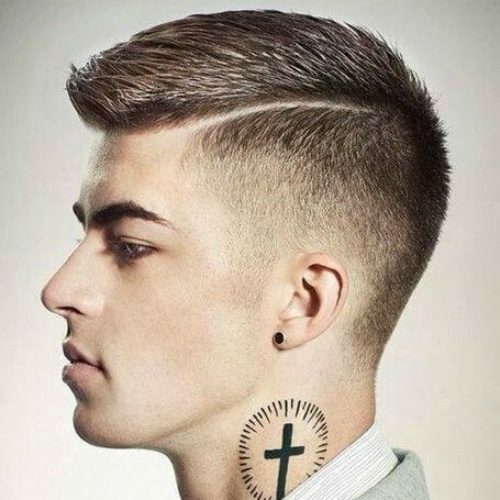 This type of Caesar haircut, dedicated to the young ones, maintains hair on the crown with the sides tapered. The strands at the top have a messy texture that you are able to sweep in messy layers. 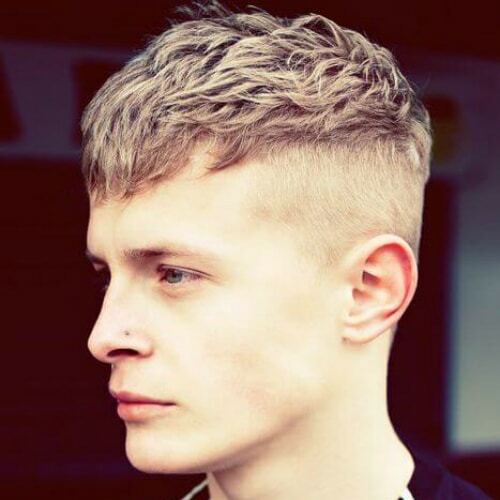 Original and modern, this light Caesar haircut is the perfect mix of funky and awesome. 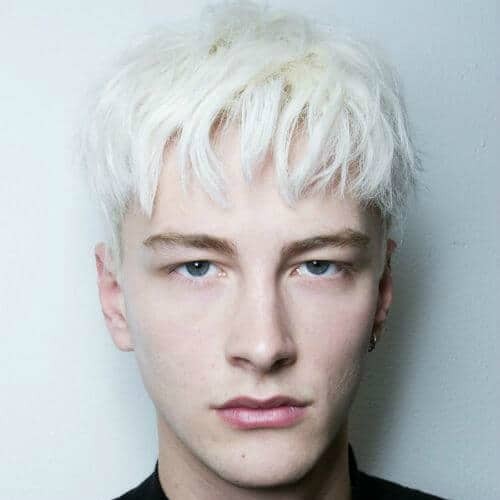 The light blonde color mixed with texture gives it a bit of bulk, which is great for thickness and finger-styling. 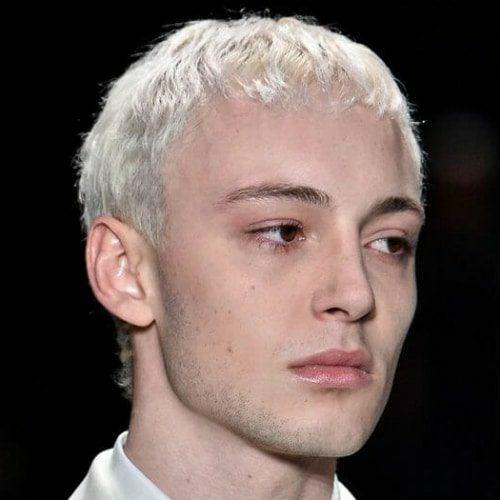 Regardless of you current trouble with receding hairline, consider this Caesar haircut one of the best options that you can get. With a few basic adjustments, you can turn this in your favor in no time. 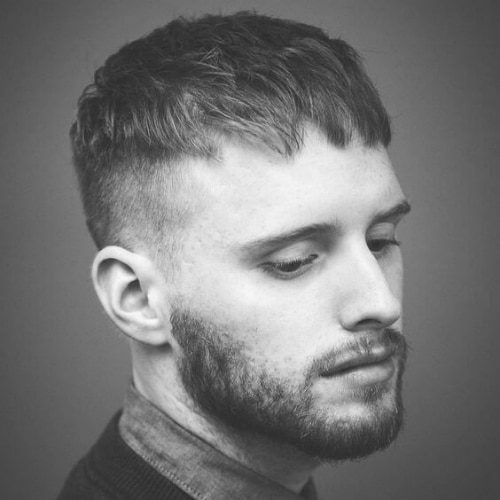 A classic Caesar haircut may look outdated but adding fade becomes the solution to wear your favorite cut in a new, contemporary way. 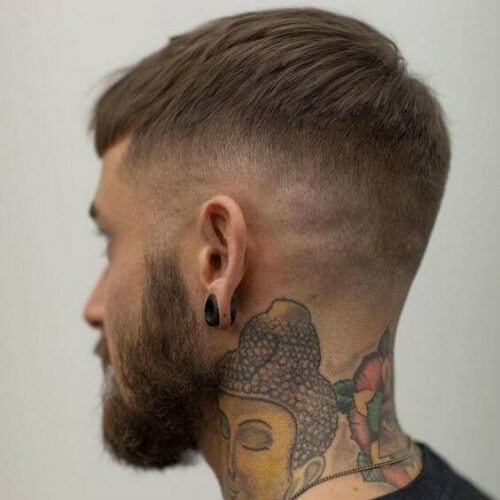 A temple fade goes well with your facial hair, blending smoothly for a balanced look. 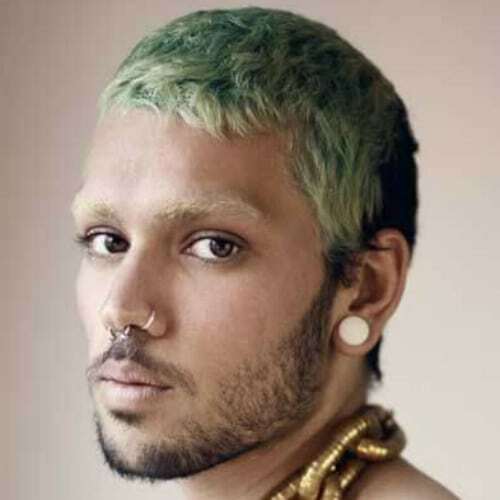 Wearing your Caesar haircut in a neon green color is fine. However, it looks just as good with any color that you prefer. This version features soft finger waves that are combed to the front for an easy, effortless look. 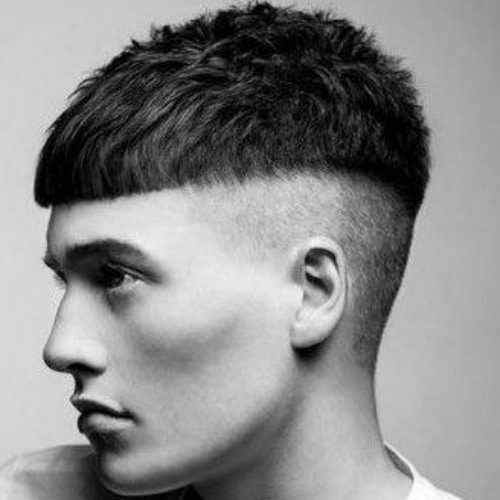 Daring, edgy and for those with a strong personality, this Caesar haircut begs to be photographed. What makes this cut attention-grabbing is the perfect rounded hairline with basically no fringe. Short buzzed bangs on the crown with an incredible uniform length are what you need at the top to form this design. 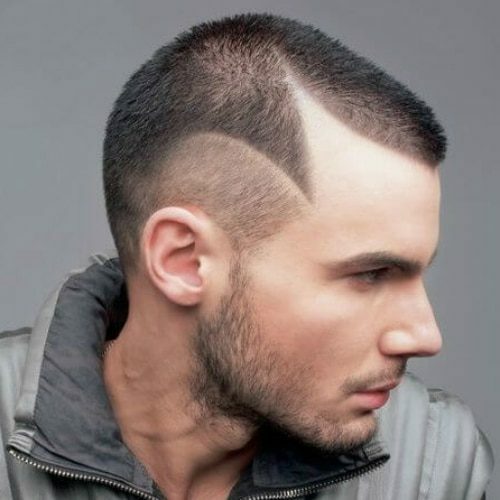 You should also fade the sides and give them hard razor lines. This is by far the simplest Caesar haircut that you can get with ease. If you want to make it wearable today, a visit to your barber can make it happen in no time, and it’s a guaranteed success. 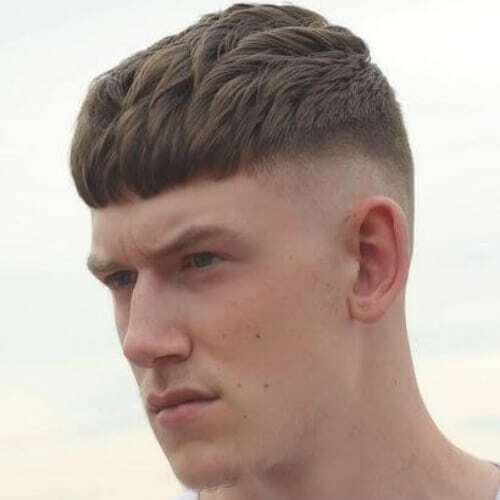 The bowl-like shape on the forehead of this haircut gives it a traditional Caesar look, but the taper fade on the sides also gives it a stylish and modern touch. 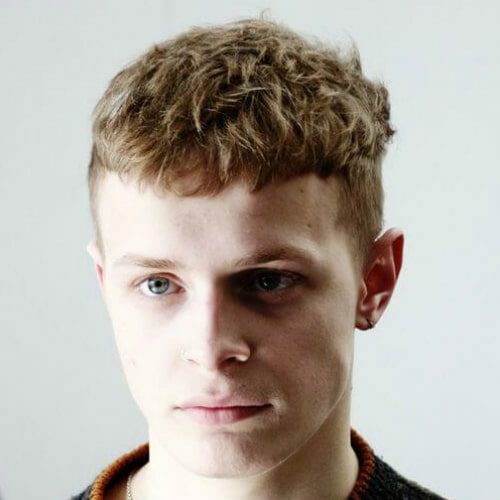 This Caesar haircut is standard with fade on the temples and extra texture on the top. The fringe is finger combed towards the front and accurately cropped with a straight line. 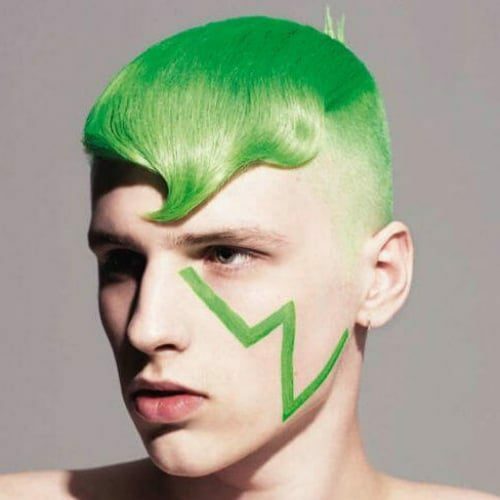 Razor crops are unique and creative designs, but the obvious thing that stands out is the color makes this one Caesar haircut distinct. If you decide to keep the same hair length everywhere, it will look majestic. 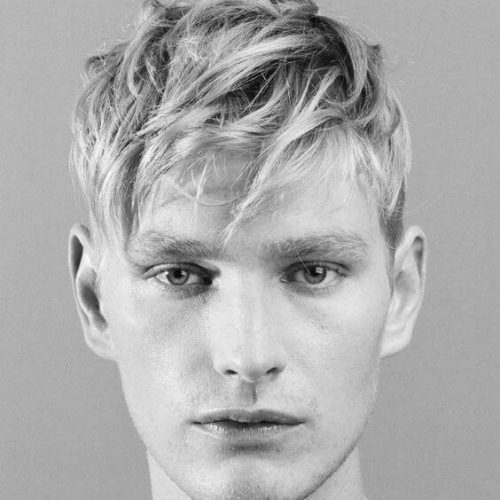 The version of this Caesar haircut below is ideal for those who want the most of their hair on the top with minimum length on the sides. You can wear it without a care because it’s easy to maintain. 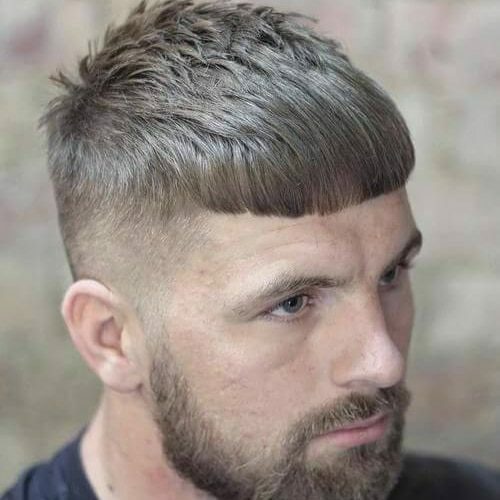 This haircut is for men with a thick hair, and it involves giving it a very dense texture at the top and cropping the front locks to create a thick fringe before finishing with low skin fade on the sides. This classy haircut will require you to maintain short bangs at the top that you should style by sweeping frontwards. The sides also have a gradual fade that also adds up to the design. According to tradition, the fringe on a Caesar haircut is very short, which is one of the main detail of this haircut. However, modern versions of the cut play with convention and add personalized touches, such as the long fringe worn in a messy way. 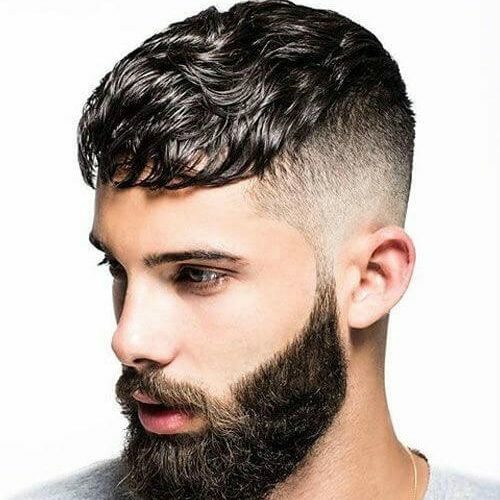 To get this look below, you need to have lots of texture on your short hair at the top and sides before blending it with the beard. 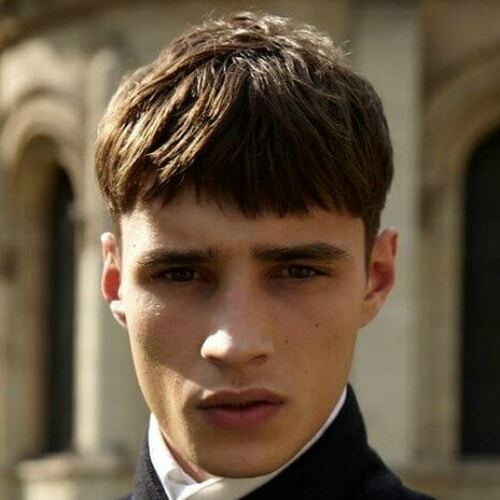 This haircut is suitable for business men and is well accepted in all official settings. 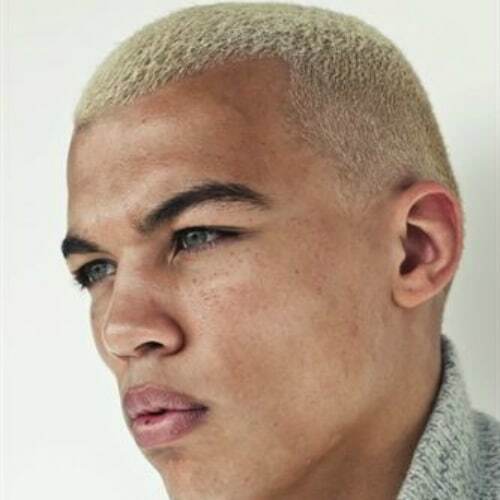 A Caesar for black men shows the outlines of the haircut better than the cut on straight blonde hair, so if you are dark-haired, you can even get an extremely short cut, not to mention that it will suit you perfectly. If you are happy-happy-joy-joy all the time, you need a haircut that goes along with your lifestyle. 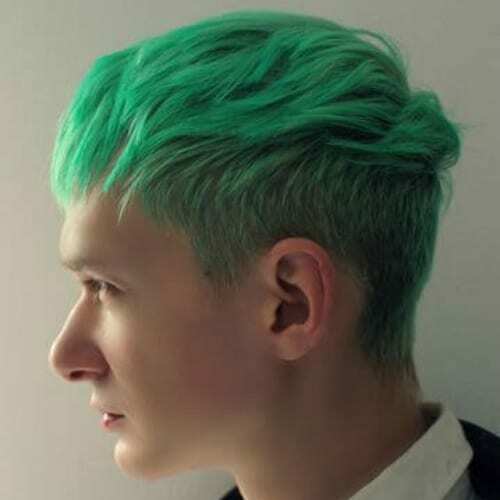 Green on the front and natural on the back, your haircut does not have to be precise. Sometimes you have to keep things simple and try a chic design like this one. In this style, you should keep short textured strands on the crown and style them with your fingers and also fade the sides. 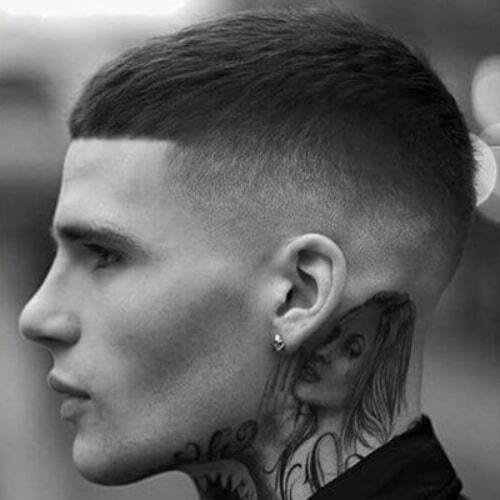 The skin fade on the sides of this haircut, make it look outstanding. 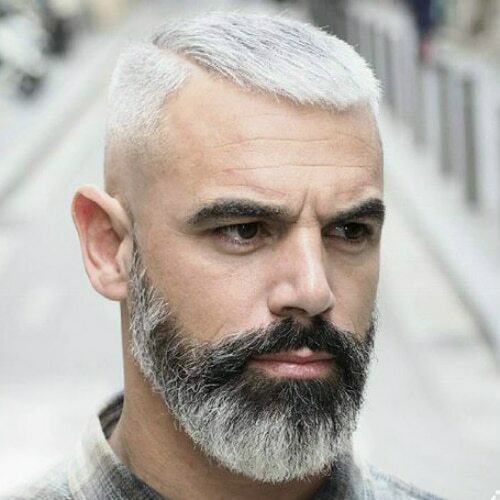 The Caesar haircut works very well for older men too, especially if you adapt it to your natural hair growth. Straight and faded is not how men’s haircuts are often described, but it definitely works here. The hair is cut straight with medium texture on top. 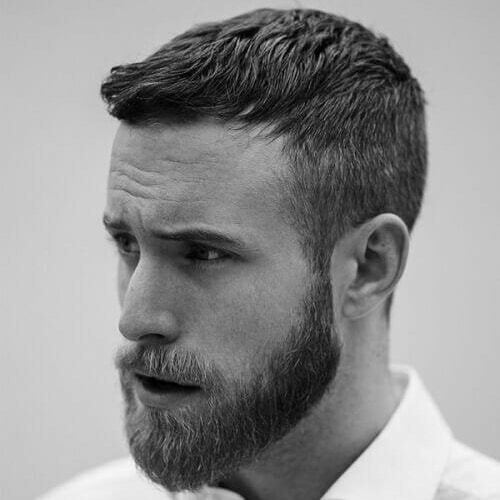 This Caesar fade is neat and perfectly cut on the top and along the sides. 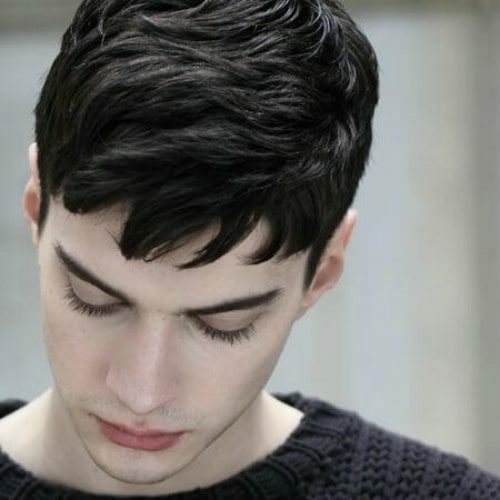 If you have thin and soft curls like these, you can still wear a magnificent haircut. 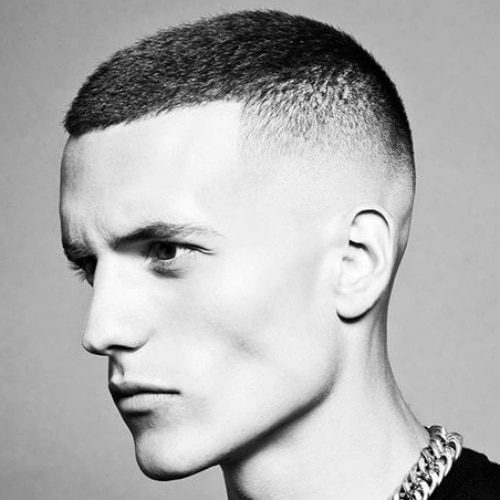 You just need to cut out the ones at the top for extra texture and styling and then balance everything with a sharp skin fade on the sides. This dashing haircut is for men that prefer to keep their strands short and neat. 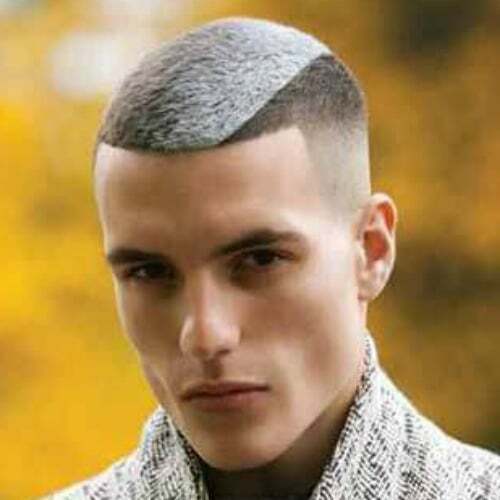 Apart from the dramatic Caesar color design the haircut also has a beautiful drop fade and line-up. 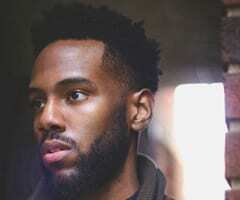 A visible cropped cut like the one at the top of this haircut can only be possible if you have the courage to let your imagination run free. Add color to the margins to accentuate the lines and to give final shape to the haircut. 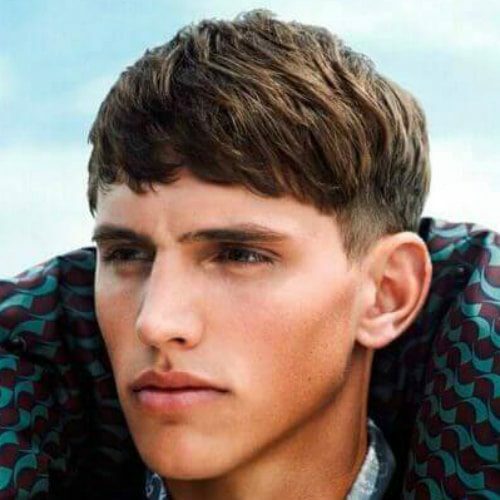 The Caesar haircut can be easily achieved just by using a reliable styling product like wax or cream and a comb. 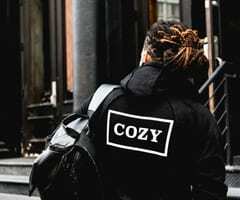 If saving time and money is your main priority, then you may even consider giving yourself a Caesar haircut by using a hair clipper and barber scissors. With so many brilliant styles available, you can start making excuses in trying one out for different occasions.